Reversing decisions made in the context of Defense Minister Anatoliy Serdyukov’s military reforms is apparently necessary, no matter how painful. In early 2010, Serdyukov and General Staff Chief Nikolay Makarov announced their intention to curtail professional contract service and rely on the one-year draft to man the Armed Forces. Scarcely more than a year later, they’ve been forced to retreat from this plan. Yesterday Deputy General Staff Chief, General-Colonel Vasiliy Smirnov said Moscow will draft only about 200,000 young men in this spring’s callup. 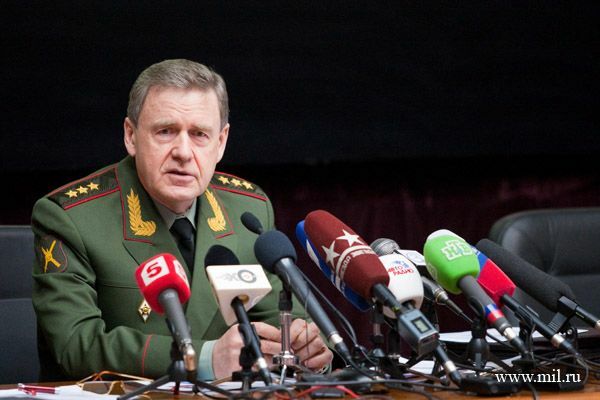 See Mil.ru’s transcript of the press-conference. The Russian military has tried to conscript in excess of 270,000 men in every draft campaign since one-year service started. But General-Colonel Smirnov said the military will now induct only 203,720 men this spring, and (not mentioning problems with numbers) he attributed the reduction to a Defense Ministry and General Staff decision to raise the quality of the callup contingent. He added that coming drafts would also aim for about 200,000 new soldiers, plus or minus 3-5 percent. The Russians are also refraining from measures to round up more men. Newsru.com noted the spring callup will run only until July 15, not August 31 which would have allowed for drafting more men before they enter higher educational institutions (VUZy). President Medvedev decided not to make technicum (post-secondary trade school) graduates liable to the draft so they can attend VUZy if they choose. Other ideas, such as extending the upper age limit for the draft from 27 to 30, or raising the service term back to 18 months or 2 years, remain off the table. So Moscow is facing its manpower limitations head-on. The simple fact is a million-man Russian Army was never going to have 600,000 or 700,000 conscripts, perhaps not even 540,000 at any given moment. Vladimir Mukhin already reported in January on the fall callup’s failure, and approximately 20 percent undermanning in the ranks. That would put draftees at about 430,000, or at what Smirnov says they now plan to conscript each year. Mikhail Lukanin wrote last June that the military’s conscription targets were unrealistic when the number of 18-year-olds alone won’t reach 600,000 during the next couple years. Army General Makarov said it himself back in September when he noted that only about 13 percent of draft-liable manpower serves in the army. His 13 percent of 3 million 18- to 27-year-olds is 390,000. Where does all this leave Russian Army manpower? Taking recent pronouncements on the intention to have 220,000 officers and 425,000 contractees in the future, conscripts might number 355,000 at some point in a million-man army. Smirnov’s statement yesterday indicates they intend to have somewhat more than 400,000 at any given time for now. Where they are today is harder. If there are 181,000 officers and 174,000 contractees (as Smirnov said yesterday), and there are no more than 540,000 conscripts presently serving, the Armed Forces are comprised of less than 900,000 men. How much less depends on the actual number of conscripts. That’s at least ten percent below their authorized level. If there are only 50o,ooo conscripts, that’s about 850,000, or 15 percent under one million, and so on.